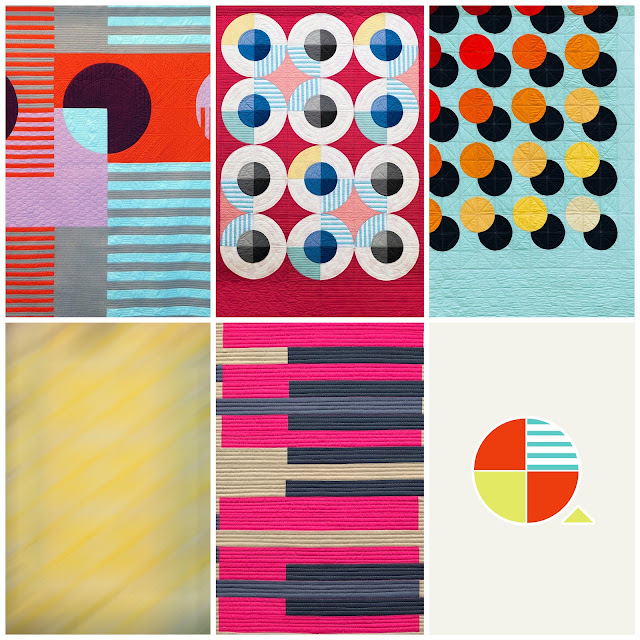 Several weeks back Christa Watson (www.christaquilts.com) asked me if I'd be interested in participating in a blog hop and giveaway for her debut fabric line Modern Marks by Benartex. I couldn't believe it, I'd been eyeing Christa's fabric line via Instagram and her blog dreaming about how I can use them in a quilt design and now I had an amazing opportunity to do just that. I set out at once playing with quilt designs and in the end I settled on a sampler styled quilt featuring many of the prints. When I got my hands on the Modern Marks fabric the first thing I noticed was how bright and saturated the colors were and then secondly what great quality the fabric was and how easy it was to work with. When I started quilting my design I couldn't help but smile when seeing these colors under my needle. They're just so cheerful. I also wanted to try some phantom shapes in a few areas of the quilt, it was too much fun. I read an excellent blog yesterday by Yvonne Fuchs (www.quiltingjetgirl.com) listing the quilts she's entering into QuiltCon 2018. I was particularly intrigued by her Transparent Ribbons entry, both of them, because they are the same design but one is in solids and the other in Christa Watson'sModern Marks prints. It will be interesting to see what the jury does. They are both so different I'm guessing they will both be accepted. Yvonne also encouraged other bloggers to share their QuiltCon entries and I loved the idea so here they are. 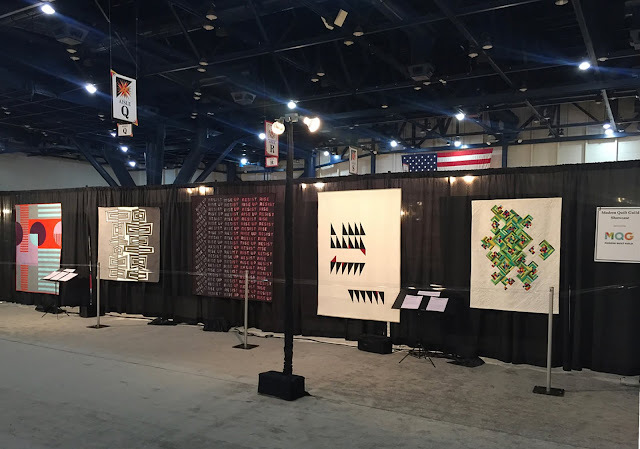 This year the Modern Quilt Guild changed some of the rules for entering quilts in QuiltCon which meant I needed to to change my entry strategy. I originally entered 10 quilts but decide to withdraw 5 after submission, more on that later. Here of the five that I still have entered. I had no doubt that I would enter this quilt. It's my favorite make this year for many reasons.